On October 19, 2017, credit union members around the world will celebrate International Credit Union Day®, an annual event to commemorate the credit union movement’s impact and achievements. In honor of this special day, HUECU invites its members and the entire community to celebrate all week long. Credit unions are not-for-profit financial cooperatives that provide an effective and viable alternative to for-profit financial institutions for over 235 million members in 109 countries worldwide. More than 68,000 credit unions exist globally, providing a plethora of financial services for their members, recognized as a force for positive economic and social change. 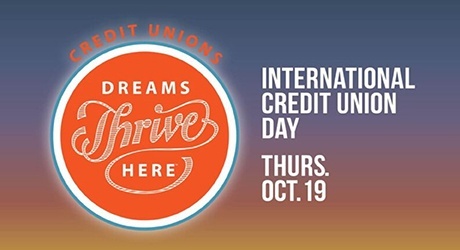 Since 1948, International Credit Union Day has been celebrated annually on the third Thursday of October. Each year, the international event affords the opportunity to remember credit unions’ proud history and promote awareness of and support for the credit union and financial cooperative difference. This year’s theme, “Dreams Thrive Here,” celebrates how credit union and other financial cooperatives serve as catalysts to make different professions, personal choices and career paths real. International Credit Union Day is recognized by the World Council of Credit Unions, the global trade association and development agency for credit unions and other financial cooperatives, as well as numerous national credit union trade associations and federations around the world. Crimson Checking: With a Crimson Checking account, you have the freedom to use any bank's ATMs completely free and unique account options that fit your everyday life. Add a Crimson Checking account and you'll earn $25 for making the switch. HUECU Platinum Mastercard: Take advantage of great rates and simple terms with a Platinum or Platinum Rewards Mastercard. When you open an account, you'll earn $25. Membership: Share HUECU with a family member or eligible coworker that you know would benefit from HUECU membership. Anyone that becomes a new member will earn $25 to celebrate their new membership. Reward bonuses are valid for new account openings that happen between October 15-21, 2017. Cash rebates valid until 10/21/2017. New membership, Crimson Checking and Credit Card applications must submitted by 10/21/2017 at 11:59pm to be qualified for the cash rebate(s). Cash rebate(s) to be deposited to HUECU Shared Savings account within 30 days of new member and/or account opening(s). Applications that are not approved or accepted do not qualify to receive the cash rebate(s). New member cash rebate is only available to individuals that are not currently an HUECU member and can not be combined with any other new member incentive offers. If a current member already has a Crimson Checking Account or Platinum/Platinum Rewards Mastercard they do not qualify for the new account opening rebate(s).